Habit: Corm +- spheric, daughter corms 1--3 on stalks. Leaf: 1--8, keeled, entire, withered in flower. Inflorescence: scape stiff, straight, cylindric, minute-scabrous; bracts 2--4, not enclosing flower buds, scarious in flower; pedicels ray-like, ascending to erect, jointed; flowers 10--35+. Flower: perianth parts +- free at base, not forming obvious tube, golden-yellow, striped +- brown or green, lobes ascending to spreading; stamens 6, filaments +- 6 mm, parallel to style, dilated bases fused to form nectar cup with shallow to awned cusps, or leaning away from style, leaving dilated bases separated, not forming cup, distally thread-like, anthers attached near base; style +- 5 mm, thread- or club-like, persistent, stigma 3-lobed. Fruit: 5--6 mm, +- spheric, 3-angled, sessile. Seed: angled, wrinkled, black-crusted. Leaf: generally 1, < 30 cm, 3--15 mm wide. Inflorescence: scape 15--70 cm; pedicels 0.5--6.5 cm. 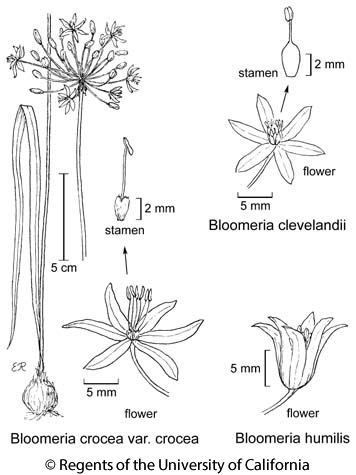 Flower: perianth 5--13 mm, lobes abruptly spreading at base, yellow with brown midvein; filaments 3--10 mm, parallel to style, nectar cup shallow, cusps obtuse to acute, anthers 1.5--3 mm; ovary 2--3 mm, style +- 6 mm, > ovary. Chromosomes: n=9. Flower: perianth 5--12 mm, yellow-orange, with 2 dark parallel lines; nectar cup cusps < 1 mm. Citation for this treatment: J. Chris Pires 2012, Bloomeria crocea var. crocea, in Jepson Flora Project (eds.) Jepson eFlora, http://ucjeps.berkeley.edu/eflora/eflora_display.php?tid=55182, accessed on April 19, 2019. CW, SW; Markers link to CCH specimen records. Yellow markers indicate records that may provide evidence for eFlora range revision or may have georeferencing or identification issues. Purple markers indicate specimens collected from a garden, greenhouse, or other non-wild location.